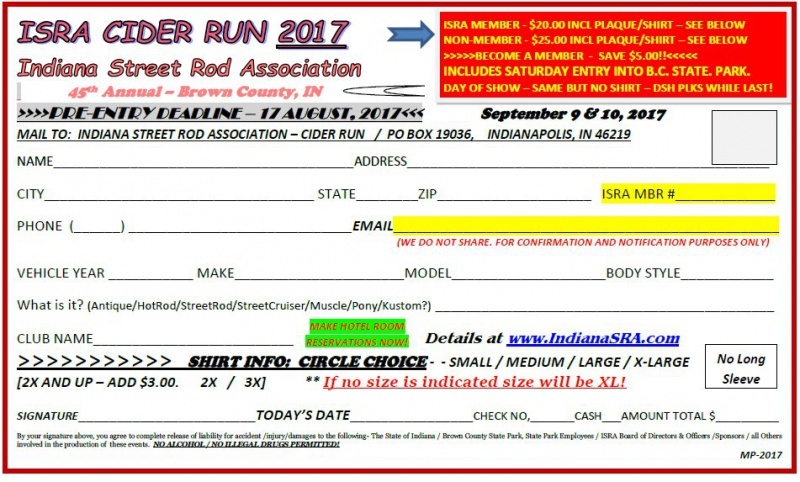 Indiana Street Rod Association - Welcome! SPRING IS COMING TO INDIANA - WE PROMISE!!! LET'S MAKE 2019 A GREAT CRUZ'N NEW YEAR! AS YOU KNOW, 2018 CIDER RUN WAS A WASH, ACTUALLY, A WASH OUT! WITH 4 TO 5 DAYS OF ALMOST CONSTANT RAIN IT WAS, WELL, A WASH OUT! WE HAD A HARDY GROUP OF 26 CARS/DRIVERS ON THE GROUNDS, HAD A GOOD TIME, LOST OUR "SHIRTS"! BUT, WE ARE A HARDY GROUP AND WE ARE ON TARGET FOR 2019. WATCH FACEBOOK FOR UPDATES AND NEW INFORMATION HERE AS IT'S AVAILABLE! 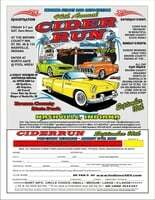 ISRA HAS SOME EXTRA 2018 CIDER RUN EVENT SHIRTS FOR SALE! >>>>GO THERE FIRST, REGISTER THEN GO TO THE STATE PARK!!!! Established in 1971 to promote the then "Street Rod" hobby on a statewide level, the I.S.R.A. 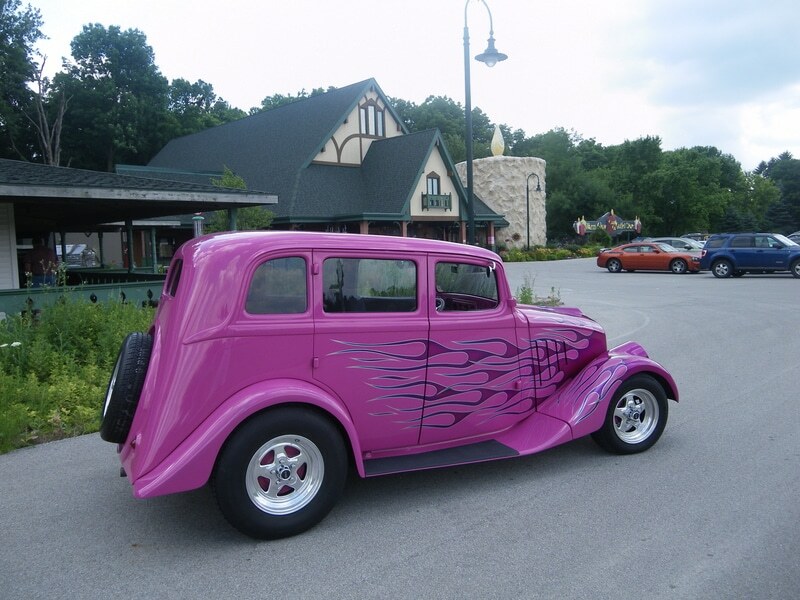 continues to provide leadership, guidance, and fun events for the enthusiasts who favor safely driving their specialty cars wherever and whenever they want. The I.S.R.A. aims to assist in maintaining a close eye on any adverse legislation that would affect all vehicles while maintaining a good relationship with those who "make" the laws. 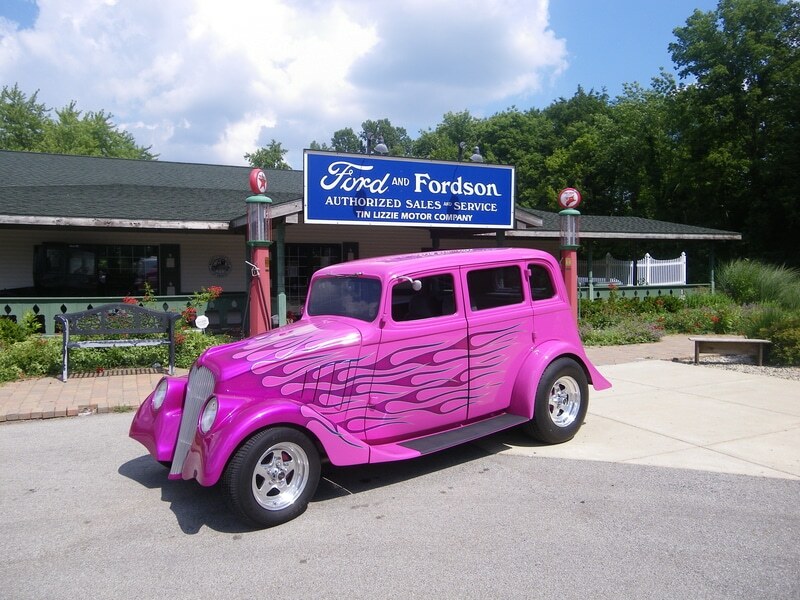 Many states have, over time, passed and/or are passing legislation which is intended to remove unsafe and poorly maintained vehicles from the road, but without special consideration for modified and updated and antique / collectable vehicles. Such laws would severely restrict our hobby. As hobbyists, we must inform and educate while being willing and ready to collectively demonstrate that we favor safety and a clean environment. ISRA intends to keep an eye on any adverse legislation which would prevent our right to build, own, and operate our vehicles. Plains are underway for the 2018 ISRA Cider Run. New Flyer art is being produced as we speak and will appear on the home page soon. Be sure to get your entry in early and tell a friend. Brown County is calling you to come hang out with ISRA. 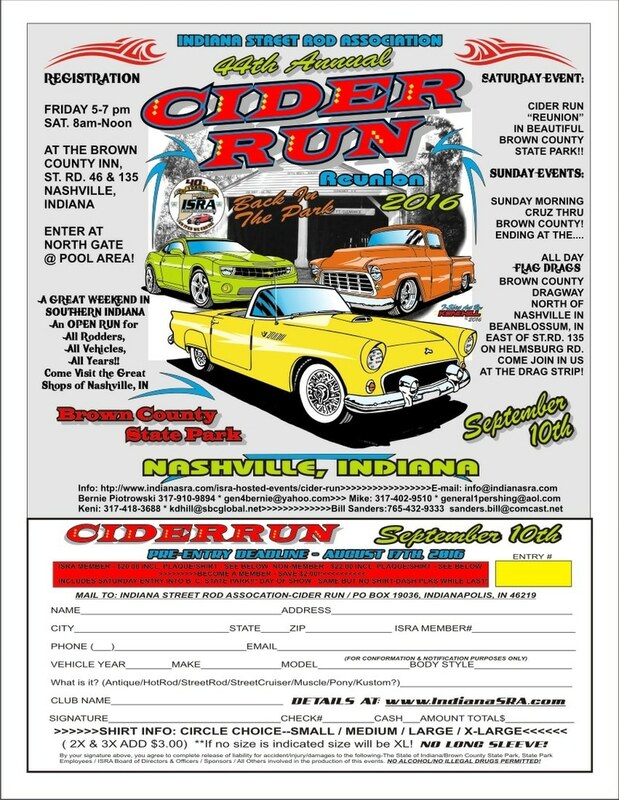 Get your entries in early for the fun in Beautiful Brown County State Park. Buddies, your Friend and come to Brown County State Park and make a Day of it! NOW IS THE TIME FOR ALL GOOD RODDERS TO PLAN FOR CIDER RUN 2016!! NOTE IT IN YOU CALENDAR! 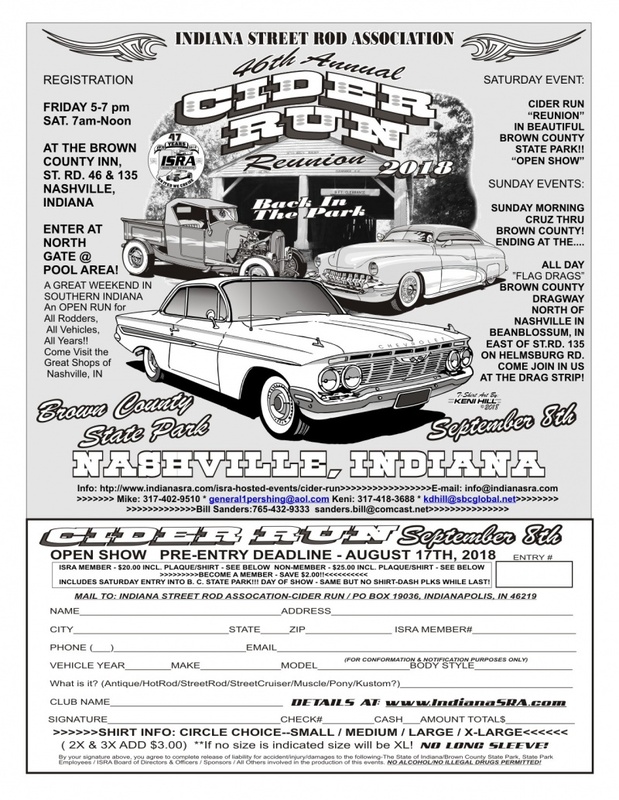 SEE Y'ALL IN BEAUTIFUL BROWN COUNTY, IN! BRING ALL YOUR BUDS AND THEIR RIDES!